Decision-makers in the climate change field have little faith in biofuels as a low-carbon technology, the World Conservation Union (IUCN) says. Unveiled at the UN climate convention meeting in Bali, its survey suggests professionals have more confidence in bicycles than in biofuels. The findings come as ministers assemble for the final part of the UN talks. Conservation groups have highlighted the impact of climate change in the tropics and the Antarctic. If nobody shows the willingness to deal with the reduction of carbon emissions to a manageable level, then what are we doing here? 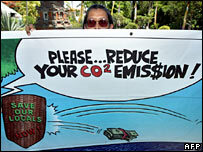 European negotiators at the two-week meeting in the beach resort of Nusa Dua are hoping that the meeting will launch a two-year process leading to a further round of binding cuts in greenhouse gas emissions, to come into force when the current Kyoto Protocol targets expire in 2012. But delegates say much ground remains to be covered as ministers from nearly 190 nations arrive for the last three days of discussions under the UN climate convention (UNFCCC) and Kyoto Protocol. But which technology? In a survey of 1,000 professionals in 105 countries, IUCN attempted to gauge which technologies inspired the most confidence. Nearly twice as many were confident in the potential of nuclear energy, while solar power for hot water and solar power for electricity emerged as the most favoured low-carbon technologies. Two presentations on the sidelines of the Bali conference have highlighted the impacts of climate change on the natural world. Conservation International (CI) researchers took forecasts from the the Intergovernmental Panel on Climate Change's (IPCC) 2007 assessment of the Earth's likely climatic future, and calculated what those forecast trends would mean for areas safeguarded for nature, such as national parks and forest reserves. They found that more than half of these zones were vulnerable to projected climate change. In 21 countries, mainly in the tropics, more than 90% of protected areas were vulnerable. "We previously assumed that if the land is protected, then the plants and animals living there will persist," said Sandy Andelman, head of CI's Tropical Ecology Assessment and Monitoring network. "That may be wishful thinking." 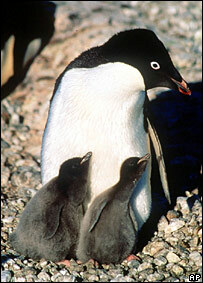 WWF, meanwhile, looked at conditions at the Earth's other climatic extreme - the cold of the Antarctic peninsula. This tendril of land that projects from the Antarctic towards the tip of South America is warming much faster than the global average. According to WWF researchers, sea ice cover has declined by about 40% over the last quarter century. "The research done over the last couple of years is that many penguin populations across Antarctica are in decline, with some dropping as much as 65%," said WWF's director-general Jim Leape. "You are seeing a massive loss of sea ice in important parts of the continent, and that sea ice is crucial to the food web of Antarctica upon which these penguins depend." Like other conservation groups, WWF is calling for the inclusion of binding targets for reducing carbon emissions in any agreement coming out of the Bali conference. A draft circulating this week calls for industrialised nations to cut their emissions by 25-40% by 2020. It is supported by the EU. But the US, Australia, Canada and Japan are arguing against the inclusion of concrete targets at this stage. "To start with a predetermined answer, we don't think is an appropriate thing to do," US chief negotiator Harlan Watson has said. But there is frustration among some developing countries at what they see as a lack of political will among the high emitters. "If nobody shows the willingness to deal with the reduction of carbon emissions to a manageable level, then what are we doing here?" Brazilian delegate Thelma Krug told the AFP news agency. Receiving the Nobel Peace Prize in Oslo yon Monday, former US Vice-President Al Gore urged the US and China to "stop using the others' behaviour as an excuse for stalemate" and work together to find a mutually acceptable way of tackling climate change. 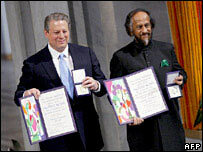 Mr Gore and his fellow Nobel laureate, IPCC chairman Rajendra Pachauri, will be in Bali for the ministerial talks, as will the new Australian Prime Minister Kevin Rudd, whose recent ratification of the Kyoto Protocol injected fresh optimism into the UN process. But three days of busy talks lie ahead if a deal is to be made.